More top-down strategic Might & Magic gameplay is coming in 2011 from Ubisoft's just-announced Heroes of Might & Magic VI. Ubisoft recently updated the Might & Magic Facebook page with a short teaser video showing an angelic character with wings that were burning away, which ended with the message: "A new Might & Magic era begins." It turns out that the era being spoken of was for Heroes of Might & Magic VI. Heroes of Might & Magic is a spin-off of the classic Might & Magic RPG series that began in the mid-1980s. However, Heroes, inspired by King's Bounty, is much different as a top-down strategy game that has players commanding various groups of heroes to accumulate resources, armies, and new cities in the quest to dominate all opponents. The series has been on a roller coaster since the release of the original Heroes of Might & Magic in 1995, with critics either loving or hating each entry in the series, though Heroes of Might & Magic IV was generally considered to be a low point, with Heroes of Might & Magic III the high point. Heroes of Might & Magic V brought the game back up to par in 2006. Heroes of Might & Magic VI is under development by Black Hole Entertainment, known for real-time tactical game Warhammer: Mark of Chaos and its expansion. The game is promoted as "remasterized" to "keep the original Heroes spirit, while enhancing the RPG elements." HOMM VI takes place 400 years before HOMM V during a war between the Angels and the dynasty of the Griffin Dukes. 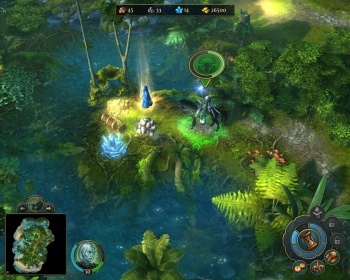 Gameplay is said to include a "brand new reputation system" that will give players choices on the paths they wish to take, and not just between going for the gold mine or the wood mill on a critical turn. It will have "extra-large adventure maps" and an "exclusive bestiary" as well. Finally, Ubisoft says HOMM VI players will be able to "post content and compete with your friends using a new and intelligent, online community interface" to tie in a social gaming aspect. The small selection of screens released show grid-based battles that take place just like they used to, and gorgeous graphics. Strategy fans should have a new game to look forward to next year.